The Professional Regulation Commission announces the results of the August 2015 Foresters Licensure Examination this August 2015. The Forester board exam was conducted in the cities of Manila & Davao. Please scroll down to view the list of passers. The Board for Foresters facilitated the said board exam on August 2 and 3, 2015. Mrs. Monina T. Uriarte, Chairman; Jose A. Lorenzo and Gerardo T. Cabreros, are the members of the board. Last year, PRC released the July 2014 Foresters board exam results with 345 passers out of 856 examinees. All takers are excited to know if they pass the said exam. Hoping this year to have more than half of the Forester exam takers to pass. 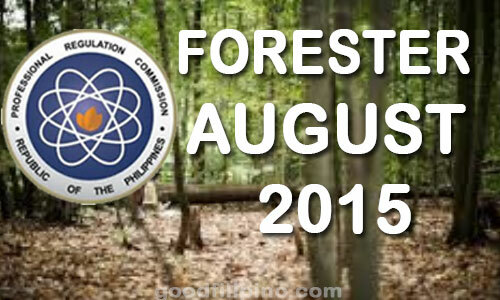 Comments or suggestions about "August 2015 Foresters Board Exam Results - PRC List of Passers (August 2015)" is important to us, you may share it by using the comment box below.